Corporate bond issuance is a new debt capital raising instrument offered by the Bank, that enables you to finance development of your business. Issuance of bonds is an attractive financing alternative! 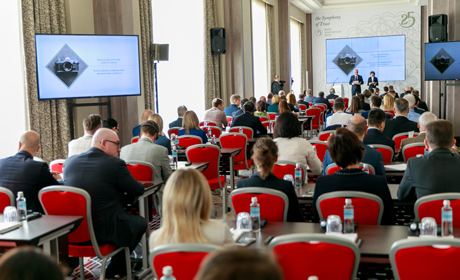 We invite you to take part in Investment forum - the platform to discuss and share world-class expertise on wealth creation and succession, learn the newest investment management strategies and generate future business prospects. Dear Clients! In connection with the Easter holiday, the Bank’s working hours have been changed: 18.04.2019. – Baltic International Bank will be open for customers until 4 p.m. 19.04.2019. and 22.04.2019. – Baltic International Bank will be closed. Please pay due attention to the above mentioned changes and plan your financial transactions in a timely manner. Happy Easter! JSC “Baltic International Bank” (Bank) will publish its audited 2018 Financial Statements until the 15th May 2019, later than the applicable statutory deadline (31 March). The Bank’s shareholders decided to change the statutory auditor in order to implement the European Central Bank’s guidelines and to comply with the highest international standards. Bank has chosen SIA “BDO Assurance” (BDO) to audit Bank’s 2018 Financial Statements. In view of the deadline set by the auditors, Bank has undertaken to make public its audited financial statements until the 15th May 2019. The Bank’s Management Board has informed the Financial and Capital Market Commission (a financial regulatory authority in the Republic of Latvia) and the Bank’s shareholders about its decision and the new deadline for publishing the audited financial statements. On 28 February 2019, Bank published its unaudited financials on Bank’s website. In practice, unaudited financial statements show, more or less, the same financial data as audited ones. Therefore, currently it is possible to get a rough picture of the Bank’s performance during the previous year. Unaudited financial data are available here. According to a revised Payment Services Directive (known as PSD2) adopted by the European Parliament, Baltic International Bank offers its API sandbox solution for Open Banking. Open Banking is an open banking platform for cooperation with financial technology companies and other partners. API Sandbox is a safe isolated environment where third-party service providers are able to test their ideas and innovations in the financial sector in general and in asset management in particular. The solution is suitable for large companies and independent developers, especially for those interested in new digital products, services and innovations. “As an integral part of our new Internet Banking project, Open Banking will serve as a platform for developing new products and services in the future. We will roll out the new Internet Banking facility at the end of summer 2019. It will offer the users new functionality, security enhancements and a wider array of services. Some of the major challenges facing the financial services enterprises today include moving towards modern digital opportunities and implementing appropriate solutions”, Head of Digital Channel Development Jānis Osis explains. “Baltic International Bank not only goes hand in hand with the newest trends in the banking industry, but even stays ahead of the trends by implementing new technologies and digital solutions that allow boost the value of the services,” J.Osis emphasizes. Bank is offering its API sandbox solution whereby two Application Programming Interfaces (APIs) are available in accordance with the second Payment Services Directive, or PSD2. API is a software intermediary that allows two applications to interact with each other both within and between organisations and share data with each other. The API sandbox solution implemented by Bank enables new players, both payment initiation service (PIS) providers and account information service (AIS) providers, to penetrate the market. Go to Open Banking About Payment Services Directive (PSD2) The revised Payment Service Directive (PSD2) became applicable on 13 January 2018. The Republic of Latvia transposed the PSD2 into national law, namely, into the Payment Services and Electronic Money Act Maksājumu pakalpojumu un elektroniskās naudas likums] PSD2. The PSD2 opened up an opportunity to develop open banking models, thus helping clients to better monitor their payments and account information. It also fosters competitive rivalry on financial markets overall. Sigma Ratings, a New York-based rating agency, assigned BBB+ financial crime compliance (FCC) rating to Baltic International Bank placing it among industry leaders. Sigma’s report also noted that the bank’s outlook is positive. Sigma Ratings reviewed Baltic International Bank’s inherent risk environment and control effectiveness around FCC. The review included FCC factors specific to AML, CFT, sanctions, and aspects of other non-credit risk issues such as geo-political risk and national-level regulatory proficiency. Chairperson of the Management Board, Baltic International Bank, Viktors Bolbats told: “We are truly delighted by the positive assessment of the renowned rating agency Sigma Ratings as it demonstrates that our hard work and increased investment in the area of fighting against financial crimes have paid off. Baltic International Bank firmly believes that privately owned banks need to shape a sustainable business model with the underlying corporate governance principles and transparency in all actions, including the fight against criminal crimes.” Some of Baltic International Bank’s key strengths, according to the Sigma Rating report, include its increased investment in compliance, both in headcount and technology, as well as sophisticated transaction monitoring system (TMS) with a comprehensive list of detection scenario rules. Baltic International Bank has advanced controls in place in order to mitigate against financial crime. Baltic International Bank deserves credit for embracing transparency and investing in its financial crime control environment. The rating speaks to a relatively strong control environment and an engaged management team that recognize the importance of proactive risk management across all three lines of defenseStuart Jones, Jr., Chief Executive Officer of Sigma Ratings In light of the overall situation faced by the sector, in 2018 Baltic International Bank invested money towards enhancing professional qualification of its employees and their expertise in the fight against financial crimes in accordance with international standards. For instance, all of the employees involved in implementing the Know Your Customer (KYC) and Know Your Customer’s Partner (KYCP) principles have undergone an in-depth AML/CFT training. The Bank has revised AML/CFT policy and related procedures and implemented new amendments requested by regulator. The Ministry of Finance (MF) and the State Revenue Service (SRS) have admitted Baltic International Bank to Gold Level of the In-depth Cooperation Programme or so-called SRS White List, thereby acknowledging the transparency of operations as well as tax compliance discipline. 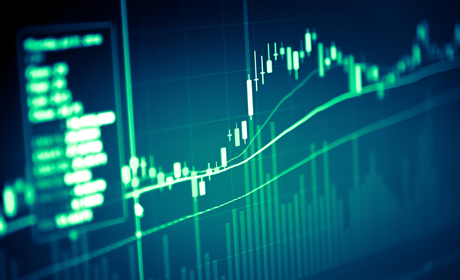 Baltic International Bank Financial Crime Compliance (FCC) Rating Report About Sigma Ratings Sigma Ratings, Inc. (“Sigma”) is a New York-based firm pioneering a technology-driven approach to assess governance and financial crime risk at the entity level. Sigma evaluates entities on non-credit risks, including financial crime compliance, governance, sanctions, corruption and reputation. Sigma’s methodologies are based on industry best practice that have been developed in consultation with the public and private sector. Sigma’s ratings are also reviewed by an independent Rating Committee before issuance. Sigma regularly presents to U.S. regulators and regulators around the world for further feedback and ideas. Sigma’s leadership team includes professionals with more than 100 years of combined experience, including deep domain expertise on counter illicit finance-related matters as senior U.S. Government, legal and development finance experts. Company clients include financial institutions and investment firms, multinational companies, insurance firms and governments in the Americas, Europe, the Middle East and Southeast Asia. Valeri Belokon, the main shareholder of Baltic International Bank and the long-standing patron of Latvian literature, who also supports the current project ‘Library’ aimed at promoting reading, believes that the existence of the literary industry is of great importance for our entire nation. Preserving literature, we preserve the Latvian culture and language. What do we leave behind, apart from language? We leave the thoughts of our people. If we lose the word, we lose the thought. Books should be published to enable us to keep a big, complete, philosophical thought.Valeri Belokon In the seventh interview in a series of video stories within the framework of the ‘Library’ project, Valeri Belokon gives a peek into his private library and tells about his personal motivation prompting him to provide support. The books have everything that we need for our life and for the life of our soul,’ he says. ‘Support to literature is my vocation and the voice of my heart. A person can support literature only if he or she understands it and needs it. It is not that literature goes with hat in hand.Valeri Belokon The patron also expresses his views on the role of literature in the preservation of the Latvian language. ‘We are in a situation where we need to maintain our language and culture. I believe that this is what we are doing at the moment and what definitely have to keep doing.’ In an interview with Baltic International Bank, the main shareholder points out, through laughter and, at the same time, very seriously, that all the answers to questions can be found in books. ‘Nowadays, people think that Google has all the answers, but I have to disappoint them by saying that this is actually not true. Books provide all the answers,’ he says. Watch full interview The full interview with Valeri Belokon is available on the home page of the ‘Library’ project at www.manabiblioteka.lv. There you can also find six other interviews published before: with writers Nora Ikstena and Māris Bērziņš, Zbigņevs Stankēvičs, metropolitan archbishop of the Roman Catholic Church, Andris Vilks, director of the National Library of Latvia (NLL), Kārina Pētersone, director of the Latvian National Library Support Society, and Vaira Vike-Freiberga, former president of Latvia. In the coming months, it is also planned to publish an interview with Uldis Bērziņš, poet and translator, Imants Lancmanis, Latvian art historian and heraldry specialist, and Sanita Stinkule, head of the Department of Ethnography of the National History Museum of Latvia. The project ‘Library’ has been created by Baltic International Bank, a long-standing patron of Latvian literature. The ‘Library’ initiative proposes to tell stories about the importance of literature in people’s lives, stories about personal libraries, their content, emotional and professional value. The development of Latvian literature is one of the long-term public support endeavours of Baltic International Bank. Believing that knowledge of culture and history of one's country is the basis of the national identity of each nation, Baltic International Bank financially supports the publishing of books of national importance and implementation of literary projects. Some of the biggest challenges financial service companies face today are a shift towards modern digital opportunities and implementation of relevant solutions. Committed to providing greater convenience for the users, Baltic International Bank (Bank) has embarked on launching an improved version of its internet banking facility. The users will benefit from functionality and security enhancements and a broader array of services. The upgraded internet banking will represent a platform for launching new products and services in the future. Bank is developing the new digital infrastructure solution in liaison with ETRONIKA the leading fintech company in the Baltic States. Bank is planning to invest around one million euros in improving the internet banking facility. Bank has already finished the first phase of the project. In June 2019, Bank will give its customers access to test the features of the first version. At the end of summer, Bank will be gradually rolling out the new internet-banking version to all customers. The transition will run until October 2019. In October, Bank will make the new facility available to all customers. Highly competitive environment in the financial sector spurs us to respond quickly to situations, be innovative and take a strategic approach to decision-making. We therefore continuously develop digital channels and invest in our infrastructure. This is vital to ensure convenient and qualitative services for our customers. New technological solutions are conducive to increasing the value of the services offered by Bank. We will launch the internet banking through combined efforts of the sector professionals and after having explored usage patterns of our customers. The internet banking will enable the customers to obtain only useful and really necessary information, save time and plan finances better and make their investments and other financial deals in a timely manner while being 100-percent sure about safety and security of their data and money.Guntars Reidzāns, Member of the Management Board at Baltic International Bank The envisaged improvements will also foster preparation of financial statements and execution of transactions in an easy and convenient way that in turn will enhance customer service experience. Bank will also make changes in the internet banking design. As Bank keeps up with and stays on top of emerging technology trends, it specifically focuses on a responsive design created to fit better various digital devices used by the customers. Thus, every user will be able to personalize the main screen by selecting the most current information and to adjust the background of the internet bank according to individual preferences. We place customer convenience and security at the heart of everything we do. A unified dashboard showing the accounts and products, a convenient internet banking navigation, and an improved OneSpan mobile Digipass solution that will allow authenticate the cardholder and authorise transactions by employing push notification to mobile phone will improve user’s experience overall. Bank is also improving already implemented AML system’s settings. In an effort to heighten Bank’s safety and security and maximise customer convenience, Bank will enable its customers to complete MiFID questionnaires and Know Your Customer (KYC) questionnaires in the Internet-banking environment (customer profile section).Jānis Osis, Head of the Digital Channels Development at Baltic International Bank ETRONIKA, a Lithuania-based fintech company having almost 20 years of experience in the Baltic financial services sector, is the project’s developer. The company developed and offered innovative digital solutions with an emphasis on security and customer convenience. Regular improvements are very necessary. Developments and opportunities in digital environment come along with new threats. In highly regulated industries, we must also take into consideration ever-changing regulations and legislative updates. By improving digital interaction, we will make the internet banking platform more efficient and more user-friendly. As a result, both Bank and its customers will enjoy new opportunities.Arnoldas Jankūnas, the Chief Executive Officer at „ETRONIKA” Innovative solutions designed specifically for payment processing will substantially boost the internet banking usage experience and will reduce the amount of time required for carrying out the activities involved. The new internet banking will enable the customers to ensure a multilevel signing of payments and a multilevel approval of applications. Bank has implemented instant payments, and customers can select them from the list of the beneficiaries. To process several payments in a quick and convenient manner, Bank has implemented batch processing functionality (or import of bulk payments) and export related to the generation of account statements, simultaneous approval of several payments, and a smart payment form that adapts itself depending on the customer-posted information. Even better communication with Bank, as provided by private banker, is available for the customers within just a ‘clickable distance’. The development of the new internet banking is only a part of the innovations that are underway. In the near future, Bank will roll out solutions such as instant payments, open banking (a platform-based business approach), investments and investment products available on the investment menu, and other solutions designed to enhance customer service experience. About ETRONIKA ETRONIKA is award winning Nordic FinTech company, offering digital platforms for finance and retail sectors, digital and mobile signature, mobile payments, digital services for point-of-sales terminals and other services. Company is based in Vilnius, Lithuania and is a part of NRD Companies. NRD Companies – a global information technology and consulting group of companies specialized in governance and economic digital infrastructure development. NRD Companies are controlled by INVL Technology UTIB – NASDAQ Vilnius listed closed-end investment in IT Businesses Company. INVL Technology managed companies operate as a cluster and implement joint projects in more than 50 countries worldwide. BANKTRON is award winning smart e-channels platform which enables financial institutions to deliver seamlessly financial services across various devices. The Ministry of Finance (MF) and the State Revenue Service (SRS) have admitted Baltic International Bank to the Gold Level of the In-depth Cooperation Programme (Padziļinātās sadarbības programma) or so-called SRS White List, thereby acknowledging the transparency of operations as well as tax compliance discipline. The In-depth Cooperation Programme of the State Revenue Service has been improved this year to promote a closer and more efficient cooperation with responsible taxpayers. 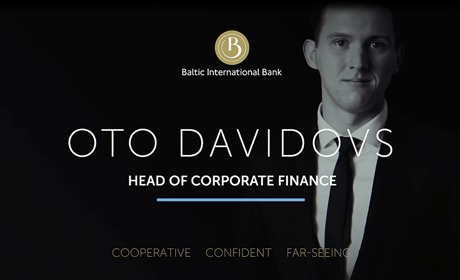 ‘Baltic International Bank is committed to responsible and transparent business conduct. In our work, we rely on the ESG (Environmental. Social. Governance) approach, where Governance (corporate management) is one of the main blocks. Baltic International Bank pays special attention to the principles of corporate governance, ensuring compliance with Latvian and international legal norms and timely payment of national taxes. Therefore, we welcome the Gold status granted by the MF and the SRS, which was awarded by evaluating the Bank's economic performance, the amount of taxes paid and a number of other criteria’, says Alon Nodelman, Member of the Management Board and Chief Financial Officer of Baltic International Bank. The sustainability and corporate responsibility of Baltic International Bank is evidenced by the gold award from the Sustainability Index received by the Bank for the second year in a row. The information published by the SRS shows that the In-depth Cooperation Programme or the White List is designed to promote a closer and more efficient cooperation with responsible taxpayers. Since 1 January 2019, participants of the In-depth Cooperation Programme are admitted to one of three levels: Gold, Silver and Bronze, depending on the volume of business. All companies are assessed on the basis of 15 key criteria to qualify for participation in the programme. Additional criteria apply to grouping, and they are different for each level. The Gold level currently comprises 79 companies. More information on the SRS website, in the section Padziļinātās sadarbības programma (In-depth Cooperation Programme).